MERRY CHRISTMAS!!!! I love how this card turned out. I even got all fancy photographing it. This year I actually got a head start. All my church cards are complete and I am half way done with my cards. I love the Concord & 9th Plaid background. It is so versatile. Change the color ink or change the color cardstock and you get a totally new feel and appearance. I started with some red cardstock and stamped it with Lawn Fawn Jet Black Ink. Then I added the thin lines with Delicata Gold Glitz and used Ranger Princess Gold embossing powder. Once I heat set it, I wiped off the residue from my embossing bag. I die cut some black cardstock with the Merry die from Concord & 9th. After stacking them I added one more layer with gold glitter paper. Slapped on some gold sequence and I was done. I hope you love this card as much as I do. 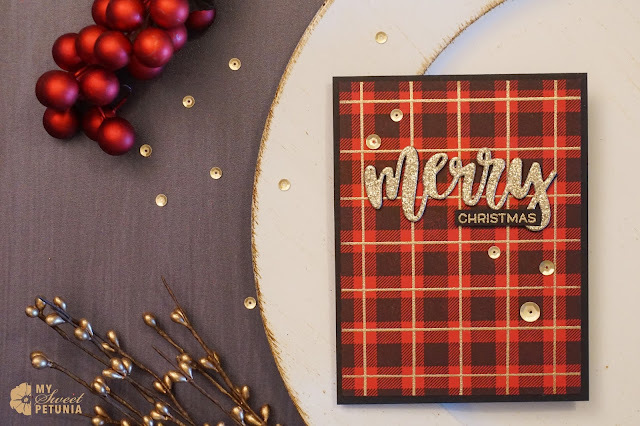 Be sure to watch the video to see what it would look like with gold foiled cardstock. That’s a great traditional Christmas card ! Both cards are great, I almost always choose glitter over foil, I just love the sparkle. Love this card!! I just got the plaid stamp and definitely need to try it out. 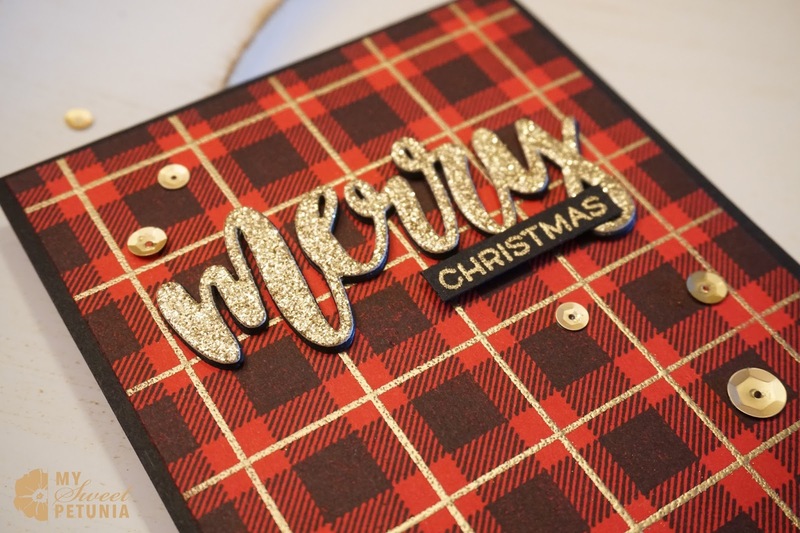 Love the glitter paper. I love this card. The glitter paper is my favorite but both are gorgeous. I just love the simplicity of this card. I've been thinking about getting a few plaid stamps lately. Does this stamp come with the fine line stamp? After looking at both cards I really like the one done with foil. I've really had a thing for foil lately and it gives the card an air of sophistication. Thanks for sharing with us. BTW just wanted you to know how much I love the new Turquoise measure labels for the original Misti. I bought mine from you when you first offered them and I use it for everything. This is so beautiful Iliana. I really love both cards actually, the gold lines throughout the plaid is gorgeous.